Club Day Lunch Run 10.45 am. Club Night Mid Winter Christmas Pot Luck Dinner 6.00 pm. First Sunday of each month At Coffee Club, Roberts Street. Special $10 menu for Club Members or order off their Menu. Register by phoning Owen on 07 378 8327. Be seated between 9.00 and 9.30am. May be followed by a run out in the country. 13	Lake Taupo Country Roads Rally - Report & Photos 27	Terrys Tyres Lake Taupo Country Road Rally 2019 Results. 28	Simon Aurisch’ 1934 Chrysler CA Sedan - Part One 38	Art Corner 39	Taupo VCC 2019 Calendar Year. Cover image: 1928 Model A Ford PickUp arrives at the Taupo Rally lunch stop. CLUB NIGHT The second Wednesday of the month at the clubrooms - Hickling Park, AC Baths Ave, Taupo. CLUB DAY Third Sunday of the Month. 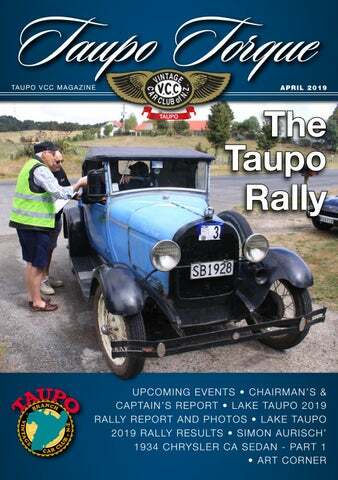 Disclaimer: The views and opinions expressed in the articles and materials presented in this magazine are those of the authors and/or reference sources, and do not necessarily reflect the views held by the Taupo Vintage Car Club or The Vintage Car Club of New Zealand. Our intention is to stimulate discussion and enthusiasm among the VCC membership and the wider community. All photos, product names, logos, and brands are property of their respective owners. Printing Tips Although you can print this magazine to A4 (either actual size or scaled to A4), this magazine has been set up in A5 format. This allows you to print 2 pages up on an A4 or even a booklet if your printer supports it. If you open the magazine file in Acrobat Reader, and select file>print, under Page Size and Handling (see image below), you can print multiple pages per sheet. Click File>Print>Multiple>Pages per sheet> 2 If your printer supports printing both sides of the paper, you can also print a ‘Booklet’. Which allows you to print, then staple and fold up into an A5 magazine. In March there is a National Executive meeting to be held in Wellington where the current issues the national VCC are dealing with. I will in the next month’s newsletter provide an update on key matters of concern to us. One of the items that I will be following up on is ‘on-line’ members applications where I am of the view the VCC hasn’t caught up with where technology is today. It is important that we make it easier for people to join. Looking ahead to May – yes it’s AGM time again, and we will be seeking new blood for many of the positions for the committee. The current team has now been around for a while, so we look forward to all members making themselves available for the management and operation of the club. We think it’s time that more of our membership stepped up to the plate and offered their time for these roles & responsibilities. Nomination forms are available from the club secretary. Neil Chave and navigator Rod Campbell leave the start of the Taupo VCC Rally in Neil’s 1963 Rover 110.
numbered carpark making our start one of the best yet, with every car leaving in an orderly manner. Thanks to the team for the carpark setup. Everyone enjoyed their run in clear skies out to the morning tea stop at Mangakino. After enjoying their morning tea, was off to Kinloch to tackle some “Straight Line Navigation” and onto our lunch stop, a fundraising effort provided by the Parents of Kids at the Country Kidz Early Child Education Center at Mokai. Our Straight Line Navigation proved challenging for some, and yes as “Chief ” Rally Route Plotter I take full responsibility for any errors that you picked up. Rally results showed that 7 cars got all the silent checks in the correct order. Each Silent check missed, or question answered wrong resulted in losing 10 points from a starting point of 200. The number of points lost out of a maximum of 350 as followed: •	Overall winner only lost 20 points, then 1 with 30 points lost, 4 with 40 points lost and,10 with 50 points lost. •	In some cases, 5 wrong answers or missed silent checks was not good enough for a prize. •	15 out of 50 answered our tricky question right: “Bonanza”. All in all a good Rally with lots of positive feedback coming to the committee after a great Prizegiving and Dinner evening. With the NI Club Captain tour joining us for our Rally it boosted our numbers with 52 cars taking to the start line. Our March Club Night become a follow up on the discussion on our recent Rally, with lots of positive feedback. Brent then showed us a DVD on early transport around NZ which included a section on early Carrying Companys in the Taupo region when all goods had to be shipped in by truck. Club Day in March is usually not held due to the committee commitment with the Taupo Rally so look forward to our lunch run in April. Looking Forward At the end of March, we have our annual Hospice Morning Tea on the 26th of March at 9.45 am. If you are able to help Please call Neil. Wednesday the 10th of April, Club Night. At this stage looking at options. Sunday the 28th of April. Lunch Run. The committee has set the Lunch Run for the 28th of April, so we donâ&#x20AC;&#x2122;t clash with Easter and Anzac day. We are looking at options, and you will be informed by email when a venue has been decided. Donâ&#x20AC;&#x2122;t forget to check out the Club program with the Navigation Run in May and our ever popular Mid Winter Christmas Dinner and Brass Monkey Run in June. Looking forward to catching up with everyone after our trip South with some interesting stories. All the best to Brent and Lorraine, Marty and Lyn on your trip to the South Island VCC Easter Rally. Drive Safe. Tony Mannington. Club Captain. Parts and Services offer a comprehensive parts and service solution for your car, van, ute, truck, trailer, caravan, fifth-wheeler or campervan. We’re all about smart servicing – that means getting the parts that you need, and servicing your vehicle to your satisfaction every time. A wide range of vehicles from around the country all lined up for the start of the Taupo Rally. Above: 1952 Austin A40 Sports. Below: 1930 Model A Ford. Stage 1 was set to travel from Start at the Clubrooms traveling to Mangakino for the morning tea stop. I believe stage 1 was a winner, except for the usual few taking wrong turns. Stage 2 from morning tea stop to lunch stop with a section of Straight line Navigation thrown in caused a few challenges for some, but the results show that 7 got full points for Straight line Navigation. We know it wasnâ&#x20AC;&#x2122;t perfect and as Rally Plotter I take full responsibility. We will try harder next time. Stage 3 was a run back to the Clubrooms, looking at the different scenic sights around Taupo. The weather on the Friday didnâ&#x20AC;&#x2122;t look too promising with lots of rain, but we knew that the Farmers and Gardeners desperately need the rain. Our bonus for the day, the weather stayed fine and clear, great motoring weather. Above: Owen Duncan’ arrives at the “Country Kidz’ Early Child Education Center in his 1946 Chev 610 Pick-Up. Below: 1928 Model A Ford Pick-Up. Above: 1969 Morris Mini. Below: Shane and Graham drive up in Grahamâ&#x20AC;&#x2122;s 1924 Durant. A great lunch provided by the “Country Kidz’ Early Child Education Center, Mokai. Our evening Prize Giving/Dinner started off with a few quiet beers while we reflected on the days Rally, getting some wonderful feedback from our Rally participants. They all enjoyed their day. With the marking finished and the results handed to me in a sealed envelope, our night was set to begin. Thanks to Neil and his team that got many of our prizes donated by local businesses around Taupo. Without the generosity of our sponsors, it would be hard to give a great selection of prizes. To all the prizes winners, congratulations on your efforts. Especially to Peter and Rosalie Donovan, EBOP VCC who won the overall Rally. Overall Taupo to Bill and Marilyn Dawson, Taupo VCC. Bill and Marilyn received their prize on Saturday night and at Club night on Wednesday Bill was still smiling. Keep smiling, Bill. As Club Captain of the Taupo VCC, I would like to extend my thanks to everyone that helped in some way to make this 2019 Rally a successful weekend. I was blown away when Pam and I turned up early on Saturday morning to help set up and found that some of you got there earlier and had everything under control. Thanks â&#x20AC;&#x153;Team Taupoâ&#x20AC;? As some of you may know, for the past 3mths I have been in New Zealand on an extended holiday break, based out of Taupo (central North Island) where three of my brothers live. I also use Taupo my 2nd home base, when time permits. Some background – I have been fiddling around with this restoration on and off for many many years, always losing momentum because work interrupts and bring progress to grinding halt. This car has been in the family since I was 12, I cut my teeth on valve grinds, fuel tank repairs, suspension works at this early stage. This very slow progress was really getting me down, so in my wisdom (or otherwise!) I decided enough is enough – let’s get it done and to a timetable of completion by the end of 2015.
services are now being offered for one off or a hand full of springs. Steering mod’s were essential as the old steering box was so worn out I would turn the wheel ¾ turn before much happened. Now I have – dear I say it, a (Ford) XW-XD recirculating ball steering box to replace the original unit. The conversion is amazing easy. An adaptor plate is bolted to the existing steering box bracket, with a couple of discrete mod’s to the steering box casing. The existing pitman arm can be reused with minor works to the spline. Now it’s like I have power steering. Don’t tell anyone!! Next Instalment and challenges (Part Two) will deal with painting, upholstery, body assembly and final detailing. Cheers Simon Aurisch The 1934 Chrysler Six was produced on two different wheelbases, 117 inches and 121 inches. Both used the 241.6 cubic inch, six cylinder engine rated at 93 horsepower. The Chrysler Six also offered one of the earliest and best (for its time) independent front coil spring suspensions, and it had a vent window that could be rolled down with the side glass. Although the work is fictional, the subject (auto and young lady) were at Napier (New Zealand) and became the inspiration for this composition. The Packard One-Twenty (also known as the One Twenty and 120) is an automobile produced by the Packard Motor Car Company of Detroit, Michigan, from 1935 to 1937 and from 1939 through the 1941 model years. The One-Twenty model designation was replaced by the Packard 200. The One-Twenty signified the first time that Packard had entered into the highly competitive mid-priced eight-cylinder car market. In its introduction year, the Packard One-Twenty was available in a broad array of body styles including two and four-door sedans, convertible and Club Coupe. The One-Twenty, weighing in at 3,688 lb (1,673 kg), was powered by an all-new Packard aluminum-head, L-head, inline eight producing 110 bhp (82 kW) at 3850 rpm. Club merchandise available on Club Nights. Baseball Cap - $14.00 Polo Shirt - $33.50 Bucket Hat - $17.00 Fleece Jacket - $59.00 Club Lapel Badges and Car Stickers We have most stock available at the club rooms. Taupo Torque is also available online with other VCC magazines via the online digital publisher Issuu. 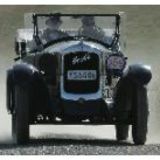 https://issuu.com/vintagecarclubofnewzealand An Issuu mobile app is also available for IOS and Android.